This ophthalmic instrument enclosure, molded by Craftech for a precision optics assembly, includes numerous tight-tolerance features and cosmetic requirements. Photo courtesy of Craftech Corporation. An Anaheim, California-based company masters engineering and the molding process. 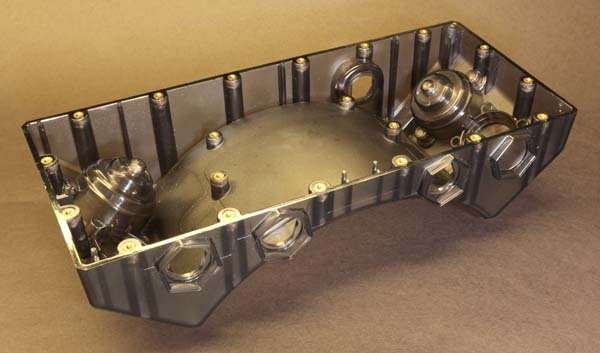 Craftech Corporation molds medical and automotive parts using the benefits and advantages that engineering brings to the injection molding process. The company was an early adopter of scientific manufacturing methods, and while some firms tout the tolerances they reach or the number of parts they manufacture per year, Craftech talks about its processes and its engineers. Craftech (www.craftechcorp.com) employs two design engineers, two process engineers, one manufacturing engineer, three quality engineers, and two secondary operations engineers. It hired outside trainers to train approximately 100 members of its 270-person staff in the use of its IQMS enterprise resource planning (ERP) software. Keeping the workers trained also improves Craftech’s ability to keep the workers, who average 13.4 years with the company. As one example, Craftech manufactures a needle for a blood pressure gauge that maintains a tolerance of 0.0006 inch, or a little more than half a thousandth of an inch. “The takeaway is that the part has to be incredibly accurate,” Butler said. Another example of a tight-tolerance, yet durable part that Craftech built while working side-by-side with the customer was a data-capture device that weighed 25 ounces. It was a two-piece enclosure that would withstand repeated six-foot drops onto concrete in temperatures ranging from minus 20 degrees Fahrenheit to 122 degrees Fahrenheit. In addition, the part had to survive 2,000 one-meter tumbles at room temperature while functioning. Craftech worked with the client’s engineering staff to develop building blocks or modules to support the unique features of the new concept. The company created prototype molds to prove the concepts. Once proven, Craftech engineers worked to optimize the design prior to designing and constructing eight complex in-house molds for the substrates, over-molds, and component parts. 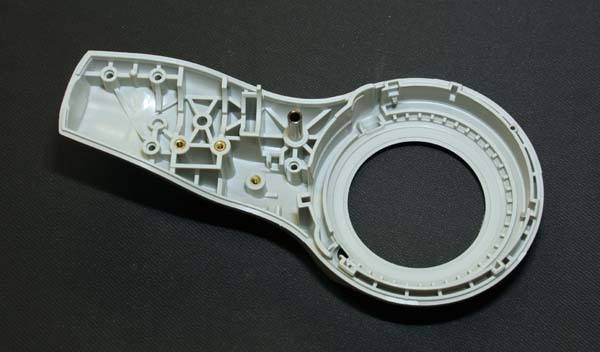 The materials were copolymer polycarbonate substrates, TPE and TPU seals and over-molds, and UV curing epoxy. 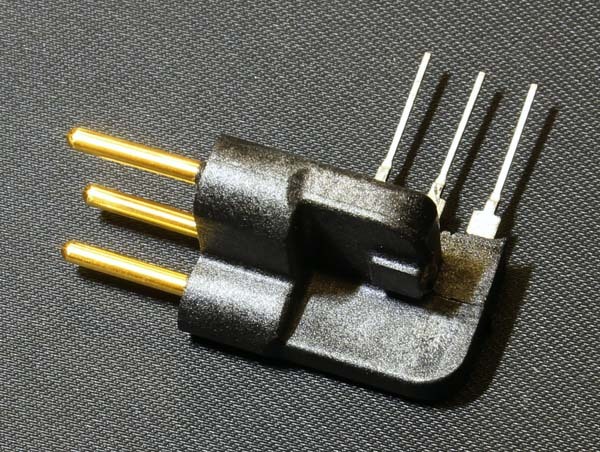 Craftech purchased the audio jack, glass lens, stamped wire-form, and threaded brass inserts. “The class 101 injection mold tooling was warranted to 1 million shots, and the actual tooling has 3.2 million shots to date,” Butler said. Craftech molded this part, which includes precision insert molded pins, for an automotive application. The component is inserted into another mold and overmolded. Photo courtesy of Craftech Corporation. To accomplish the job, Craftech created three automated work cells run by four robots with custom end-of-arm tooling that was designed and built in-house. The cells featured a custom UV application and curing machine, sonic welding fixtures and horns, pad printing nests, and 100 percent final inspection of sealing and continuity of the audio jack assembly. On this project, Craftech used a number of manufacturing processes that included injection molding, over molding, insert molding, sonic welding, pad printing, UV dispersing and curing, plus mechanical and electric testing. Craftech engineers wants to understand everything about the part before they start. Talking to and understanding the customer informed the manufacturing process. The presence of engineers on staff helps build customer confidence. “Design engineers rely on our engineering staff to aid them in designing the most cost-efficient products. We routinely simplify complex designs or make them manufacturable, combine multiple parts, and have the capability to work on high part-count programs,” Butler said. Craftech, founded in 1979, operates two manufacturing plants in North America: its headquarters and main plant in Anaheim, California, and a second plant in Tijuana, Mexico. The company employs 270 people and has earned ISO 9001, ISO 13485, and TS 16949 quality certifications. With injection molding presses ranging in clamping pressure from 12 tons to 720 tons, Craftech is able to manufacture larger medical and electronic enclosures, as well as very small components and medical disposables. Today, the company’s 90,000 square feet of manufacturing space includes a class 10,000 clean room and a class 100,000 clean room. In addition to the medical industry, Craftech also serves the automotive, consumer, and electronics markets. Besides custom injection molding, the company offers elastomeric overmolding, insert molding, and alternate temperature control molding to enhance product value. “After the tooling is built, we painstakingly develop a process based on scientific molding principles, then challenge the process by the use of Design of Experiments (DOE) to determine process limits. This is typically done with the molding process, but it can [be], and often times is, carried out in the secondary processes,” Butler said. This first responder electronics enclosure is molded of high heat-resistant polymer. Craftech reported that the 26 threaded inserts are verified within three seconds. Photo courtesy of Craftech Corporation. In one case, Craftech was working with a German optics company that wanted to develop an ophthalmic instrument, a precision optics assembly that would let a clinician and patient dial in a lens prescription without having to go through the traditional manual, trial lens exchange process. The part, to be made of PTFE fortified acetal, had to meet several tight tolerances. A ribbed bore had to hold a 0.0020 inch tolerance; the true position from the tubular post to the bore needed to hold a 0.005 inch tolerance; and square inserted pins had to form a diameter within 0.0040 inch. “I told him the part couldn’t be made. We took it on, worked through a lot of issues, but triumphed in the end,” Butler said. Craftech has trained its employees in RJG Inc.’s scientific approach to injection molding, which was born in the 1960s as a way to manage what happens inside a mold. RJG created sensors to observe the mold, and it offers training on how a manufacturer can use that information from inside the mold to make better parts. “Oversimplified, the faster you get the material into the mold, the less the viscosity of the material changes. By reducing the viscosity change, the repeatability process is greatly improved, especially taking into account the lot-to-lot variability in raw materials,” Butler said. Sensors in the molds tell Craftech the speed of the material, the heat, and its viscosity. Craftech trained its workers in the IQMS enterprise resource planning (ERP) software, designed to reduce errors, decrease lead time, increase company-wide productivity, improve quality, and increase quantity production. IQMS software gathers detailed production data and delivers it as needed to improve efficiency. “The data is collected automatically by our ERP system, IQMS,” Butler said. “Using this system, we can monitor the shop floor at any time on any computer, but what good does that do if the people who are accountable and responsible for maintaining it are working on the manufacturing floor? We’ve developed a large format display, visible from anywhere, that displays press status, cycle, scrap, and downtime, and it’s color coded so anyone can easily categorize a particular issue. At any time, we can generate a report to review efficiency and reasons for downtime. “IQMS is the lifeblood of our company, and it would be next to impossible to run our business without it,” he added. “More than half our staff are trained to use the system. At regularly held management meetings, we analyze reasons for downtime and if, for instance, machine maintenance is a repeated offender on a particular machine, we engage the team to find out why and resolve the issue. We make proactive decisions to retire machines based on maintenance cost justification from this data. Another step Craftech uses to ensure quality are various in-line checking devices and manufacturing aids. Butler said that one device lets worker verify that each of the 35 inserts are in place in one part.